The Bellweather Revivals by Benjamin Wood. I still enjoyed this book, but not as much as I had anticipated. The Night Circus by Erin Morgenstern. I wasn't sure what to expect and it really blew me away. Well, I actually read a few more crime/thrillers this year than usual, some of which were very good, others only average. I'd love to reread the Vampire Empire Trilogy if I get chance. Probably Greyfriar from the Vampire Empire Trilogy. I would say 1Q84 by Haruki Marukami. It's the one that made me think the most. Well, I only got around to reading the Game of Thrones books and the Hunger Games books this year. Any section of The Night Circus by Erin Morgenstern - it was beautiful prose. The Game of Thrones books were all pretty long, as was 1Q84. But then I also read several indie-published novellas. So I read books from as little as 80 pages, but to around 1000 pages. But the average was probably 300-400 pages. Definitely the Vampire Empire books. I kept wanting to tell my husband about it everytime an amazing scene happened. 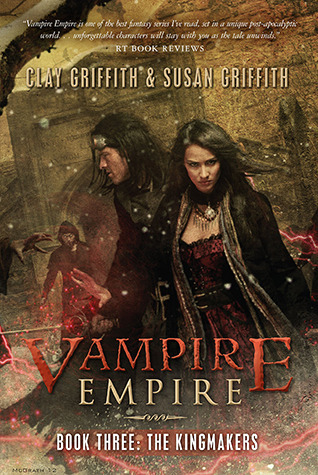 Adele and Greyfriar in the Vampire Empire books. Bring Up the Bodies by Hilary Mantel. I love her writing. Well, I've been wanting to reread some classics that I haven't picked up in 10-15 years and never seem to get to. So that might be my goal for 2013. Continue to meet new bloggers and readers, make new friends and share the love of books. I also hope to fit in more time for my own writing again as I've lagged behind this year since starting my new job in April. I really liked The Night Circus as well. It's not really the sort of book I usually read but there was just something magical about it.